Feadship has recently launched its 92.5-metre superyacht project hull No 1005 at its shipyard in Makkum, The Netherlands. We spotted Feadship superyacht hull 1005 being transfered to Makkum back in May of 2013. Details of hull 1005 are highly guarded as this owner is particularly private, according to Feadship. 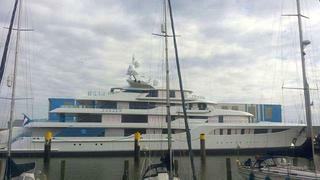 The Feadship Fan page posted this snapshot photo, above, which should satiate some curiosity. Particulars of hull 1005 that are known include, of course, that she is 92.5 metres in length, has a gross tonnage exceeding 2,900 GT, and she will accommodate 14 guests and 22 crew members. She features design by Feadship's in-house designers, while interior design is said to be by London-based superyacht designer Seymour Diamond, whose design projects include the second-largest yacht in the world, the famed Blohm+Voss superyacht Eclipse. The steel-and-aluminium Feadship hull 1005 superyacht is Lloyd's registered and MCA compliant. This is the Dutch builder's third launch this year. Feadship launched 46-metre superyacht Como in January, and superyacht Rock.It was launched by Feadship in September.